Pizza di Cork. And More. A change is as good as a rest. They say. 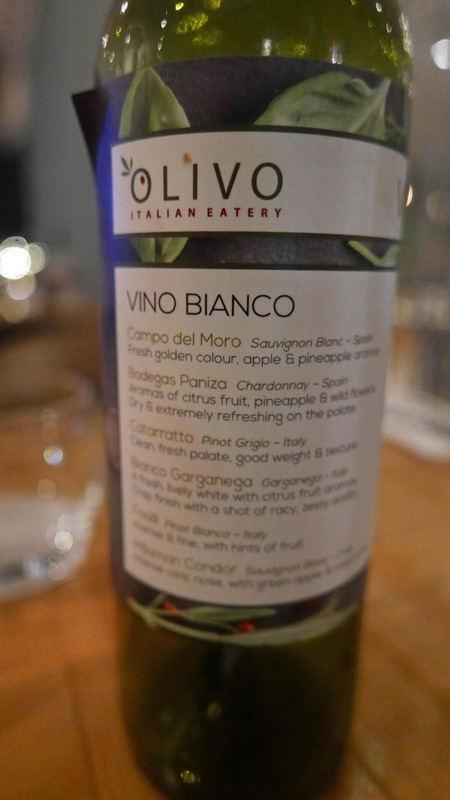 And it worked well for us at Olivo, the Italian restaurant in the Cork Airport Hotel. 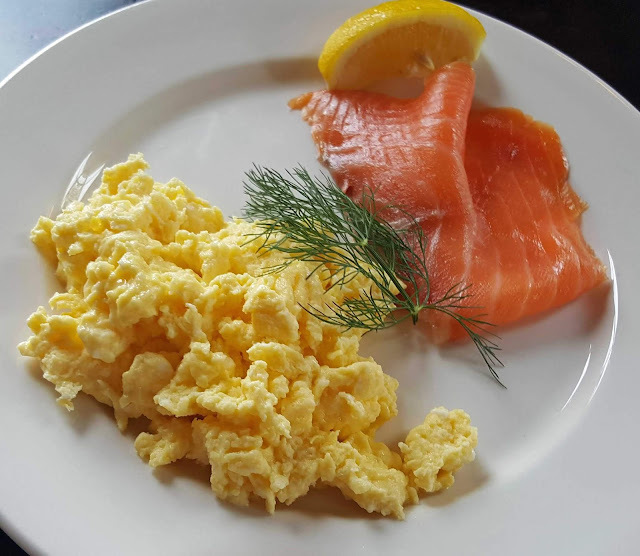 I was impressed with their contribution to the Cork Gourmet Trail late last year and, armed with a “two main course for the price of one” from that event, we headed out there the week before last. 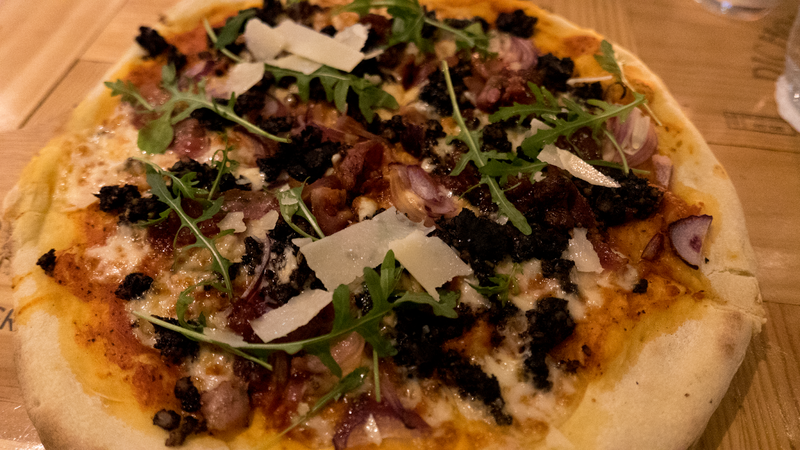 Before arriving, I had more or less settled on my mains: Pizza di Cork with tomato sauce, Clonakilty black pudding, crispy bacon, red onion and Ballymaloe relish (€16.00). And I wasn't at all disappointed. It was excellent, a perfect combination of tastes and flavours, amazing how well the black pudding and relish combined. The base was fine and the red onion also played a key sweetening role. Pizza di Cork was a star. 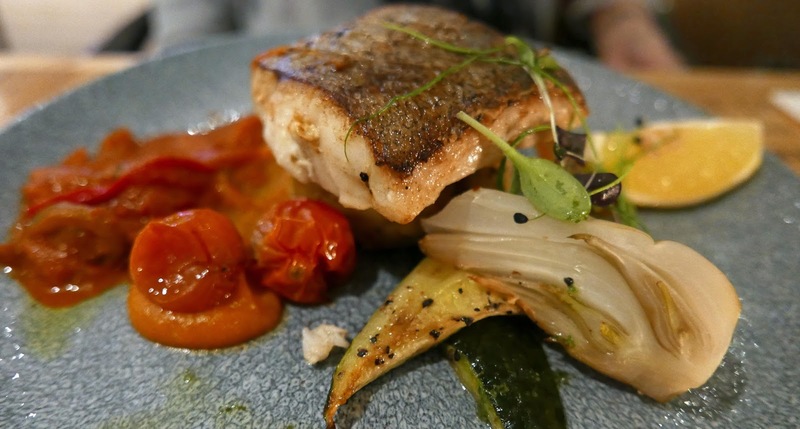 And across the table, the Nasello, oven baked fillet of hake with roasted courgettes, peperonata and basil pesto (18.00) also proved a winner, proving that you don't need a creamy sauce to get the best from fresh fish. Olivo is a spacious comfortable casual restaurant for residents and walk-ins alike. There is a bar area, a couple of big screen TVs over the drinks selection (spotted a few bottles there from Torc Brewing in Killarney), a dining area, and an adjoining breakfast space, all sections nicely laid out and lit. The wine list by the way is already on your table - check out that bottle (back and front). The menu, with a Specials insert, is laid out in typically Italian fashion. 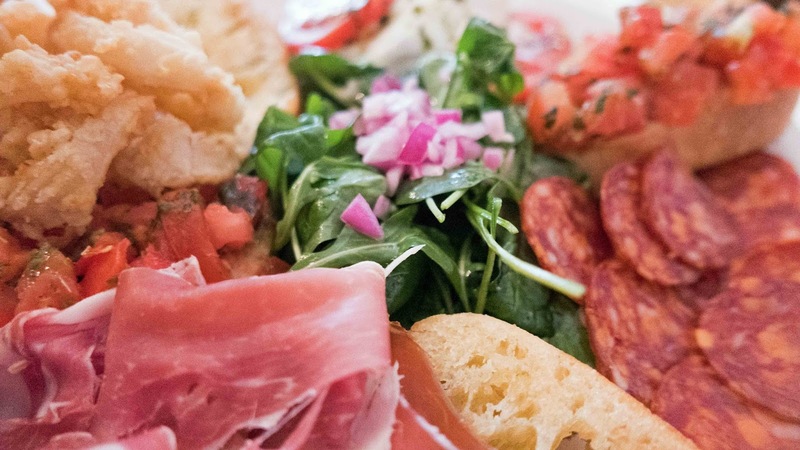 You have a good choice of Antipasti and Salads. 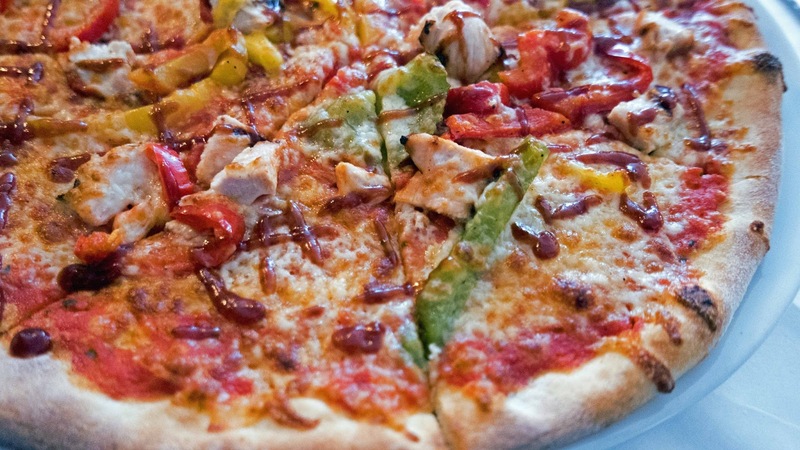 Pizzas, of course, and also Contorni (sides) which range from a Fresh Garden salad to Hand Cut Fries. No shortage of Pasta dishes either - I was tempted by the Cannelloni. And then there’s meat and fish, including chicken dishes, hamburger, lamb shank and sirloin steak. 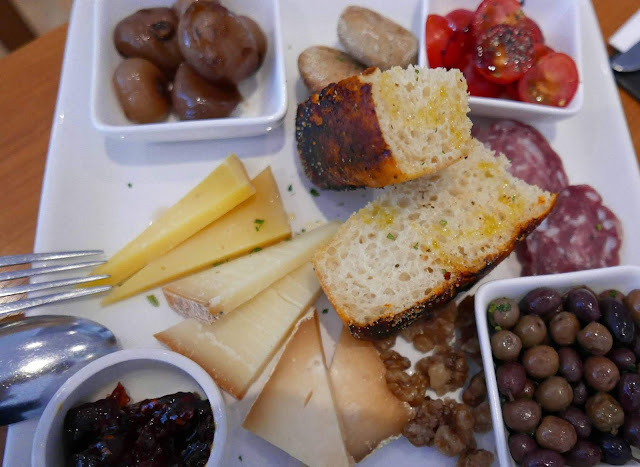 We started off with a couple of the Antipasti. 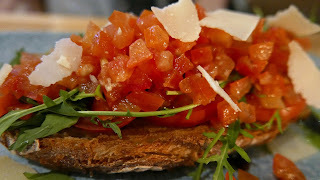 CL’s Bruschetta al pomodoro was Tomato, garlic & basil, with rocket & parmesan (8.00). Quite a plateful but easy to eat and delicious. 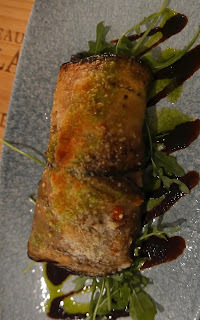 My pick was the Melanzane ripiene: stuffed aubergine with mozzarella and sun dried tomato pesto (7.00). Another delicious and surprisingly moist plateful, another substantial starter. Service was friendly, casual but efficient. Nice spot if you’re in the area and looking for “a change”! And if you want a rest, well then you can stay overnight! Parking, by the way, is free for restaurant customers. Rossini’s. Local and Italian Misto. 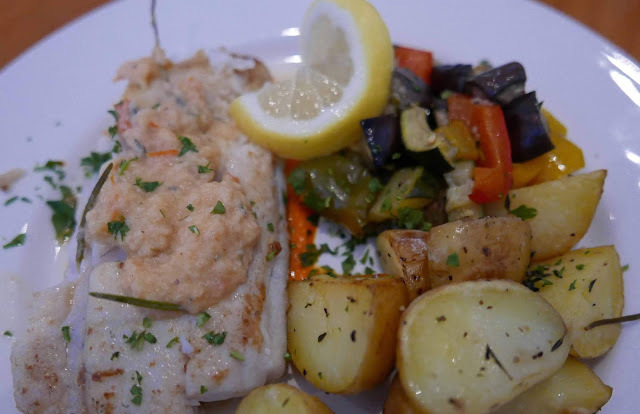 When you dine in Rossini’s, you get a taste of Italy, as you'd expect, and a taste of Ireland as many of the fresh ingredients are bought in the nearby English Market. 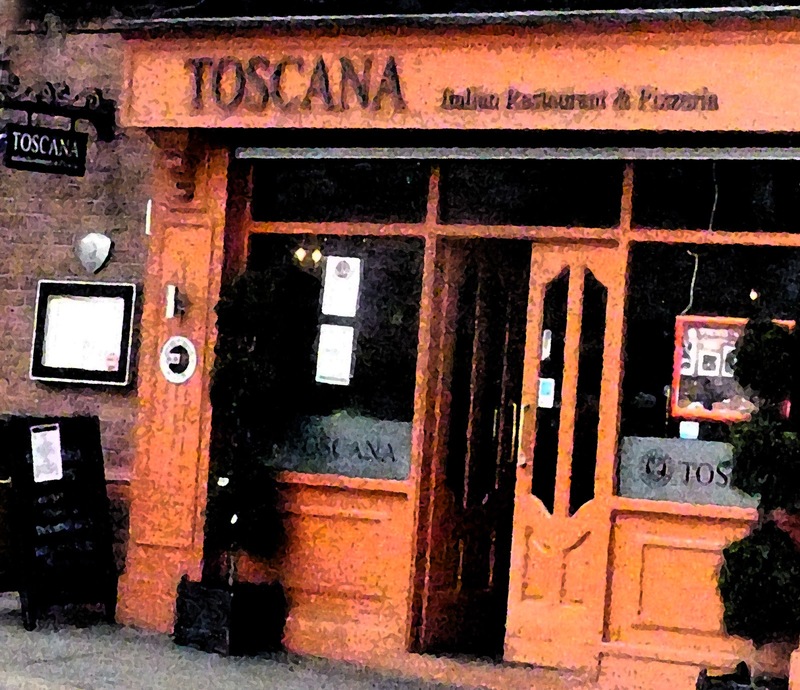 Rossini’s was established, in Princes Street, Cork, in 1994, by Antonio Toscano and their reputation for delicious authentic Italian cuisine quickly grew in the Cork area. I hadn't been there for quite a while until last week. It was a quiet night around town, the Tuesday after the Bank Holiday. So we had to settle for Italian music on the stereo - no live music, no dancing in the aisle. Still turned out to be a very enjoyable meal indeed. No shortage of starters on the menu. 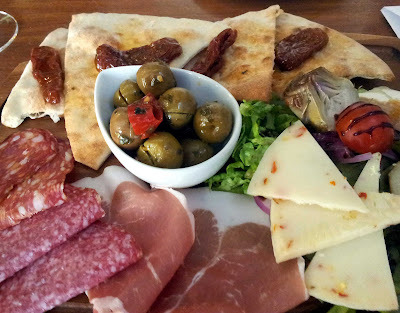 We were finding it hard to choose and so settled on the Antipasta Misto. This turned out to be quite a plateful, a very tasty plateful indeed. There were some calamari fritte, some delicious Mozzarella with big slices of tomato, some bruschetta, cured meats too, breads, salad…. Good food and good value at €15.00. They have their own pizza oven here, built by a champion! And I enjoyed my champ of a pizza, the Cacciatora: BBQ sauce on the base, pulled chicken and lots of peppers (15.00). 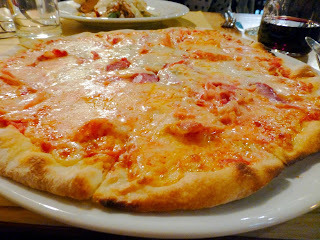 Not too sure that Cacciatora was the best name for it but it sure was one of the best pizzas I've eaten. No shortage of choice for the main courses, pizzas of course and pasta dishes too. They have quite a few steak options, chicken options, and fish options (including a risotto marinara). CL paid particular attention to the chicken and eventually picked the Pollo Saltimbocca (15.90) over the Pollo Parmigiana. She was very happy with the choice and enjoyed her chicken wrapped in ham and a tasty and interesting selection of veg that included roast potatoes, courgettes, red onions, red pepper and cauliflower. The wines were Italian, of course, and we opted for a glass of Valpolicella (7.50) and an excellent Soave (7.25). No dessert on the night so our total, before tip, came to €60.65. Rossini’s make it easy for you to try out their food without breaking the bank. They have about three set menus that start from €14.90 up. You’d have a choice of two or three starters and two or three mains. You could for instance have Calamari as starter and the Saltimbocca as mains and it wouldn't break the bank. Add a glass of house wine or dessert for 4.50. Watch out too for their special nights (eg Valentine’s) and you might also like to try them via Deliveroo. 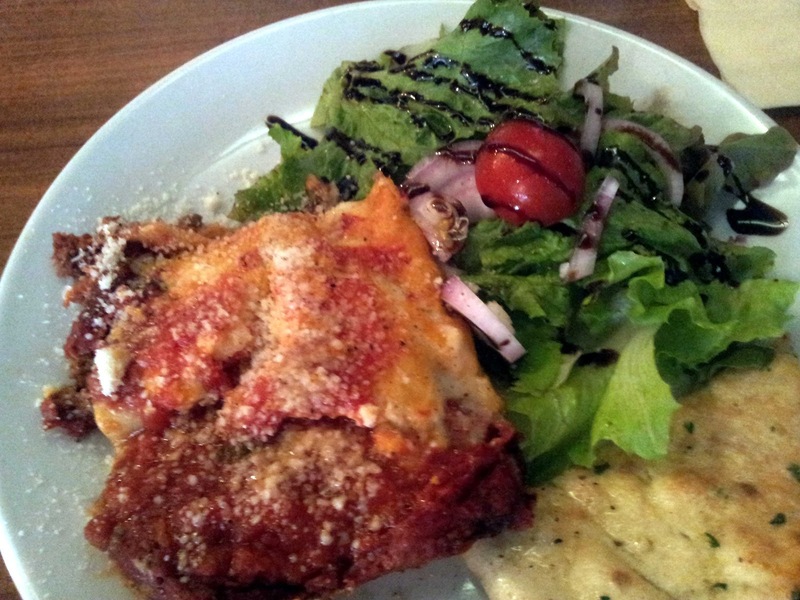 And I see too that a tasty looking Pollo Cacciatora features on their well-priced lunch menu (Fridays, Saturdays only). Opening hours: 5.00 to 10.00pm Sunday to Thursday. 1.00 to 11.00pm Friday to Saturday. Check their Facebook https://www.facebook.com/ristoranterossinis/ for updates. We were in the mood for Italian, food that is, in Dublin one night last week. We had Dunne & Crescenzi on our short list and a recommendation from Joanne (@dudara on Twitter), a Cork “exile” in Dublin for the past nine years or so, sent us off to South Frederick Street and a lovely meal. Quite a big crowd in, though the two rooms weren't full and that gave us the chance to have a look at the Italian wine (over 200 types, I think), stored in shelves on all the walls. We settled on a Valpolicella Classico Biologico La Corte Del Pozzo (8.00) and a Rosso di Montepulciano Fossolupaio DOC (8.50), both smooth, both perfect. Just as well we weren't ordering a bottle - we could have been there all night, such was the extent of the list. As it was it took a quite a while to read through the menu, pages and pages of great choice. We had been nibbling at earlier venues so a small starter was in order and we found just the thing under the Stuzzichini heading. The word means snacks (approximately) but still the plates were large enough, reasonably priced at six euro each. They were also very appetising. 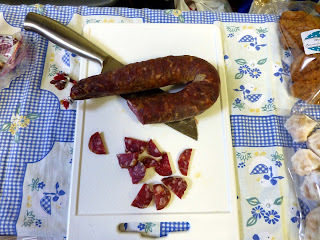 One was Porzione di salumi misti (Portion of Emilia Romagna charcuterie) and the other Porzione di Speck di Trento (Portion of smoked prosciutto). Big tasty snacks! They had a couple of specials on the board and the translation was done with a friendly gusto - service overall was excellent. 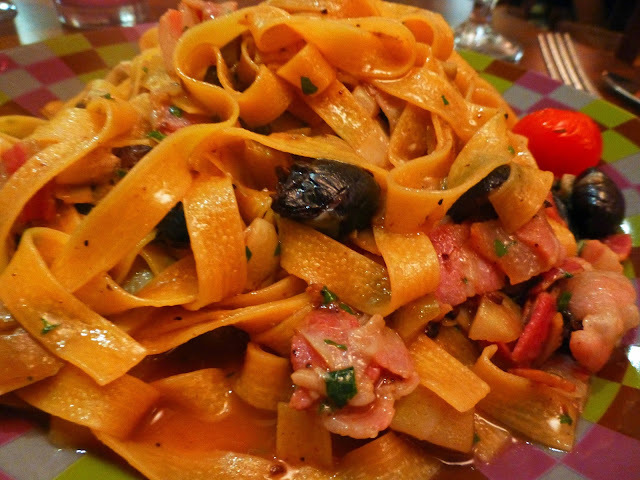 I picked one from the board: Tagliatelle con pancetta Tuscana, olive taggiasche, carciofi e pecorino (15.50), that is, if I remember rightly, Tagliatelle with Tuscan bacon, olives, artichokes and pecorino. I loved it, every little bit, loved the colours, the textures, the flavours, not least the olives that added a salty contrast. CL went for the Salsiccia senese e fagioli borlotti, Slow cooked fragrant Tuscan fresh sausage, tomato and borlotti bean casserole (13.50). It was a cool enough night and this was a warming dish, that beautiful sausage and a small mountain of beans. As I mentioned, we had been "grazing" elsewhere earlier, so reluctantly left the Tiramisu and the other desserts alone. Instead we settled for a delicious glass of Vinsanto Tuscany. This well balanced sweet wine was dispatched slowly, sip by sip, postponing all the sweet while our exit into the cool night. The hotel though wasn't too far away. If you're looking for an Italian around Grafton Street or the Stephen’s Green area, then Dunne and Crescenzi is Very Highly Recommended. SuperValu’s Italian Wine Sale kicks off this Thursday (16th April) and the team there have gone for the reds in a big way, with Amarone (€20.00) and Montepulciano’ d’Abruzzo (15.00) featuring. Whites are scarce but if you have a celebration at hand, even if you haven't, then the Lunetta Prosecco (15.00) fits the bill. 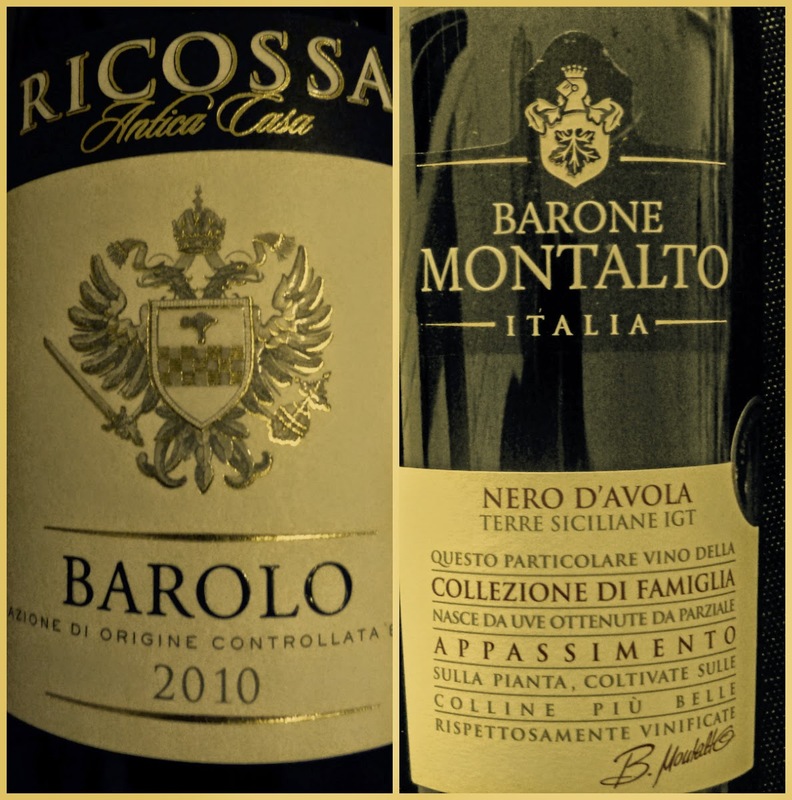 There are quite a few wines new to SuperValu and some excellent ones also at the lower end of the price spectrum, including the enjoyable Ricossa Barbera D’Asti. I notice there are two “old” friends on offer as well: the Sopra Sasso Amarone and Sartori Valpolicella. Both are very highly recommend. Check previous reviews here . Another star is the Ricossa Barola (below). Barbera is the most heavily planted grape in Piedmont; the wines are soft and fruity though the style can vary widely. 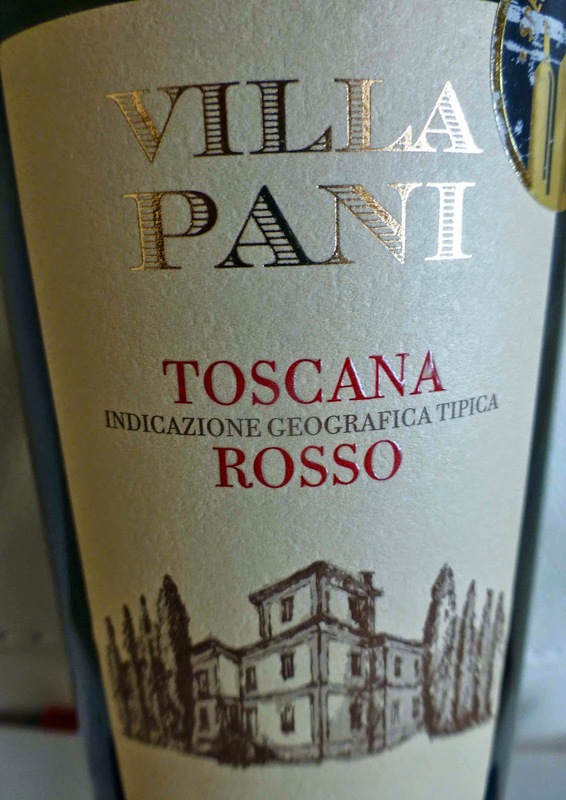 Red fruit flavours (cherries, raspberries, currants) abound here but with a refreshing tingle of acidity. 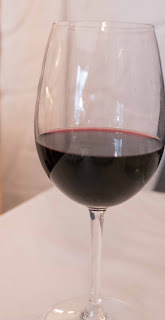 It is medium bodied with a soft texture and a decent finish. Easy drinking and highly recommended. Some of the words on Italian labels can be a bit strange to many of us. Nero D’Avola is Sicily’s native grape but the term appassimento is mainly associated with winemaking in the north of Italy, think Amarone. In the north, the harvested grapes are spread out to dry, in a process that can last from October to January. The longer the drying, the more the concentration. It is an ancient practice. However the concentration in the case of this bottle (according to the producer's website), is achieved by allowing the grapes to partially wither on the vines. The later winemaking includes 4 months aging in French oak barrels. Colour is a lightish red. The wine itself (new to SuperValu) is medium bodied with fruit flavours and hints of spice, an apparent sweetness too and a lingering finish, that “sweetness” coming from the concentration due to the drying of the fruit. Recommended. Red is the colour again, though a rather lighter one. Fairly intense aromas of dark fruit. It is full bodied and elegant, with hints of spice, noticeably dry. Terrific balance overall though and with a long velvety finish. “Classy from beginning to end” and Very Highly Recommended.Probably one of the best buys at the moment. The Barolo is made from the Nebbiolo grape and has spent at least two years in wooden barrels. Warm colours outside and a warm welcome inside. That was the experience at Toscana in Dublin’s Dame Street last week. And it didn’t flatter to deceive as I enjoyed a really good lunch at this city centre Italian restaurant, established over a decade ago. Had a good look at their lunch offer of two courses for ten euro. You could pick from four starters and seven main courses. But since we were on a break and had time to spare we picked from the A La Carte which went way beyond the normal pasta and pizza lists. 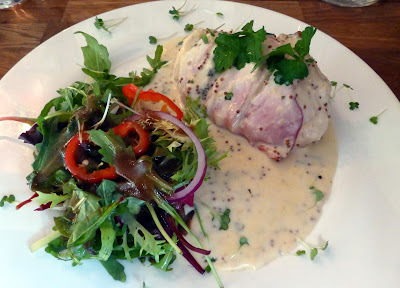 I settled on their Pollo alla Toscana: Chicken Supreme with Spinach, Three Cheeses, wrapped in Parma Ham and served with a white wine and mustard cream (€16.95). I was given a choice of sides and went for their salad. Must say I thoroughly enjoyed this light and tasty dish and that salad. Most of their fresh produce (vegetables and salads) comes from their own farm (in Wicklow) and not too many restaurants can say that. 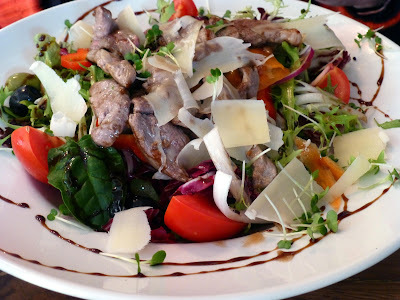 CL ordered the Duck Salad (€16.75) which consisted of warm fresh duck, rocket and mixed leaves, sun ripened cherry tomatoes, sweet balsamic and parmesan shavings. Another substantial plateful and a really satisfying one. They have many menus here so it is well worth checking out the website before you go. And there is no shortage of choice on the wine front either, the vast majority of it from Italy. If you are going by the glass, you have four choices in red and four in white, but, if you are going by the bottle, you could be a while making up your mind as the wines come from all parts, from the north to the south and not forgetting the islands! The place is neat and tidy and the wall decor consists of large black and white photos of Italian characters going about their daily lives, not the film stars you sometimes see in Italian restaurants. The place can cater for couples or larger groups and I would like to go back there by night as I reckon you’d have a great atmosphere, especially on Sunday when a singer entertains. Service is friendly and efficient and the prices are reasonable for the excellent quality delivered to your table. Definably worth a try. Dame Street - Opposite Dublin Castle, Dublin 2. 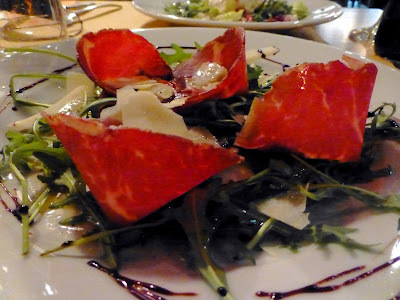 After a warm welcome at the reception desk, we studied the menu and picked our starters: Bresaola (Beef Carpaccio and rocket salad) and Caprese (Mozzarella and Tomato salad), each at €6.50. Both were very well presented and really enjoyable. Moved on then to the main courses where you are more or less confined to either pasta or pizza, though with a good choice of each, all around the €12.50 mark, give or take a euro or so. Here I choose the Rustica Pizza with tomato, mozzarella, rolled Italian Bacon and blue cheese. Very impressive on the plate and quite tasty with the blue cheese providing quite a kick in spots and the bacon giving a different texture here and there. Finished it off with pleasure. The other mains came from the pasta list and was the Parmigiana (oven baked aubergine with mozzarella, tomato sauce, parmesan and basil). Again this was well presented and really tasty, something like a lasagne with aubergine instead of meat. 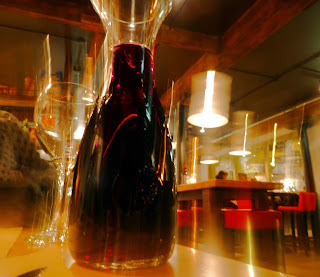 Both the mains were washed down with a decent house wine, €11.50 for a 50cl carafe of Barbera which had inviting aromas and was pleasant and easy drinking. They have Moretti beer in bottle, Perroni on tap and also a “guest” Italian artisan beer. Now time for dessert, all around a fiver. There is a rather short list, augmented by two specials. One of the specials was Tiramisu and it was rather special, sweet stuff indeed. I went for one of the regulars: Affogato (Gelato ice cream drained into coffee and sambuca). Enjoyed this even if it had more of a coffee kick, less Sambuca. Made up for that though by finishing off with a Sambuca Black (5.00). Had been thinking of a Grappa but I like the aniseed taste here and it came with Cantuccio biscuits. If you enjoy pizza and pasta, then this is the place for you. Open from 5.00pm Tuesday to Sunday. This weekend Rico Valleballa launched his new Italian Restaurant ‘Rico’s’ in The Mardyke Entertainment Complex, Sheares Street, Cork! 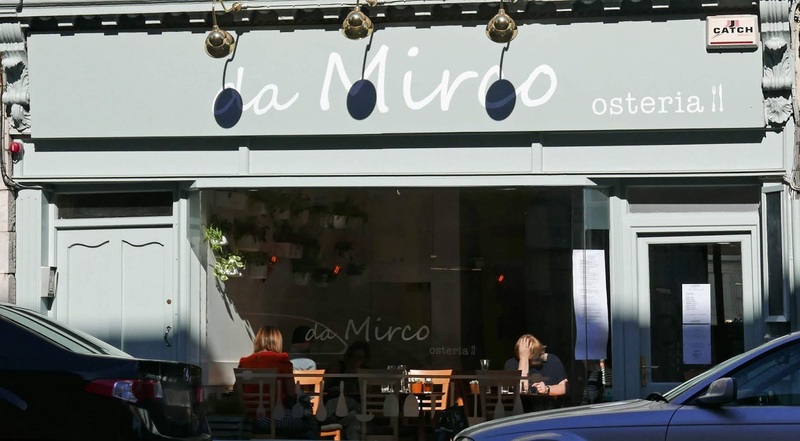 People queued for over an hour before doors opened at 5.30pm last Sunday when Rico himself welcomed the guests and showcased his new Italian menu. Guests were very impressed with the new eatery, the delicious food and friendly atmosphere: “Outstanding food at great prices” ...“The Italian’s really know good food”...“A great place for all the family”. Rico’s menu shows he takes great pride in carrying on the tradition of recipes handed down from his grandmother to his Mother and to the Vallebella Peccerillo family. The family love a celebration and any occasion is the cause for a long meal and a noisy gathering over favourite plates like gnocchetti sardi, ditali piselli or calamari e patate. 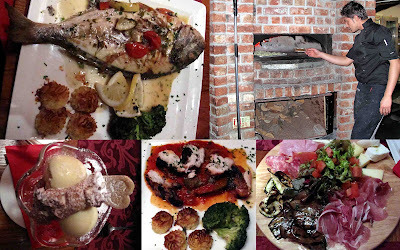 Riccardo began trading at Farmers Markets with signature dishes Parmigano and ‘arranchini’ filled rice balls, and within a few years had opened The Castle Bar and Trattoria at Blackrock Castle and Baile Bella, a pizzeria at Blackrock Village. 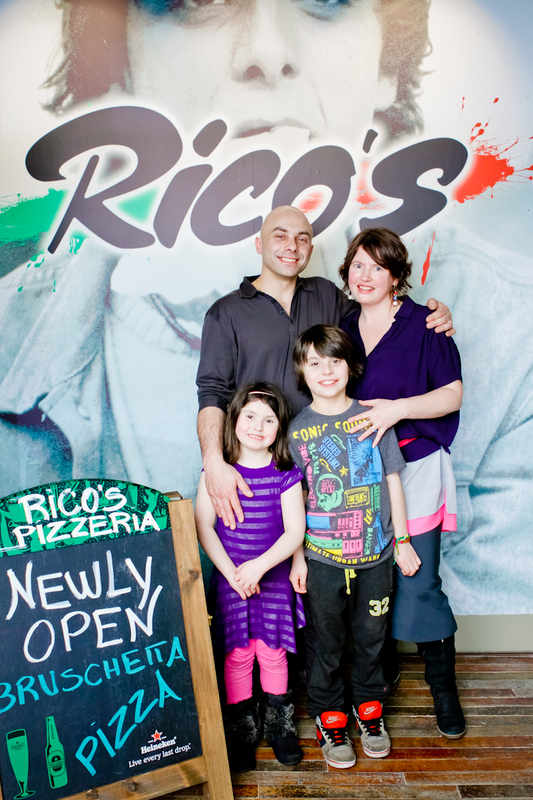 Riccardo Vallebella’s new Italian venture in Cork is Rico’s at the Mardyke Entertainment Complex and assures you’ll find a familiar mix of fresh fast real food at good prices. 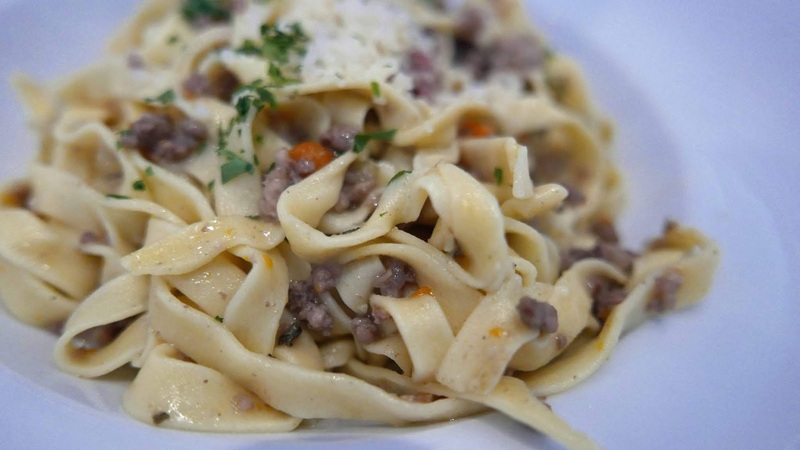 Family favourite pasta and pizza dishes will feature along with daily specials from Mama’s recipe book. 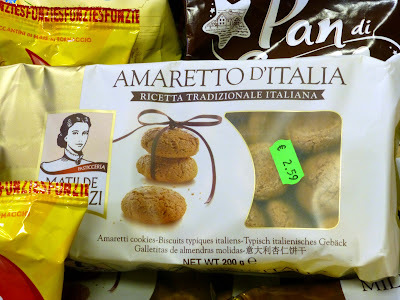 Start with antipasta and finish with ammazza caffé (to kill the coffee) and eat like the Italians! Adjoining Rico’s is the new Mardyke Ping Pong bar, the first of its kind in Ireland. So you can enjoy delicious Italian food followed by a few drinks and some Ping Pong – Now there’s a night with a difference! English brought Riccardo Vallebella to Ireland from Rome in 1996 but the Irish kept him here once the young Italian broke free of Dublin’s Little Italy. It took coming to Cork for the Jazz in 1999 for Rico to learn the English language and the ways of the Irish and it was to a backdrop of a lively Cork scene that this took place. Rico started working in Cork’s social hot spots at the time including the Bodega, Rumplestiltskins and the Yumi Yuki Club at Triskel. His ease with the customer and skill behind a service counter soon brought him to management attention but it was his love for the kitchen that raised the bar. Rico and his late brother Maurizio (who followed his trail from Rome to Cork) had grown up with a natural affinity to food and cooking that was second nature. The family home was the hub for the Vallebella Peccerillo clan and Amalia their mother the centre of this clatter her four sons enjoyed. 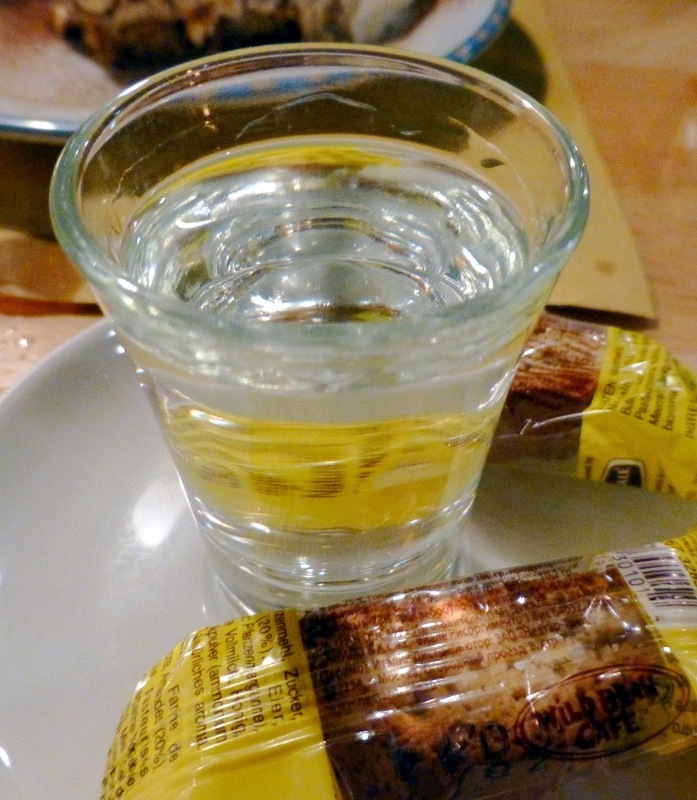 Rico’s father Antonello comes from Porto Torres, Sardinia, and Amalia from Casserta, Naples, and the Roman kitchen became the expression of these food cultures. Sunday lunch for thirty plus is a regular occurrence there and the travelling sons brought this knowledge of food and function to Cork where it was widely welcomed. 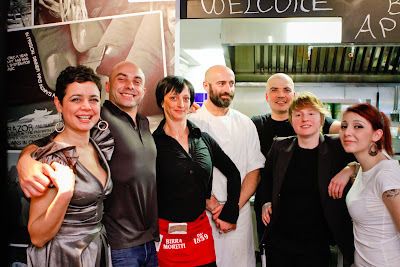 It made sense then that this familiarity with food would translate into business and Riccardo and Maurizio opened Buon Appetitto followed by Casanova at Triskel Arts Centre in 2001. The style was ‘agriturismo’ where a short set menu described the season’s dishes and staples like bruschetta and antipasta plates allowed the seasonal toppings like aubergine, artichoke or baby roma tomatoes to feature on the toasted pane casareccio bread or board. The main courses of ‘Primi’ (usually a pasta, polenta or rice dish) and ‘Secundi’ (featuring the daily special of meat, fish or vegetable) followed this tradition of allowing the harvest food to take centre stage. Started off last Saturday’s Food Trail in the city with a visit to a church, of all places. The Unitarian Church in Prince’s Street, Cork’s oldest church, was playing host to the Irlanda Italiana Cultural Association. 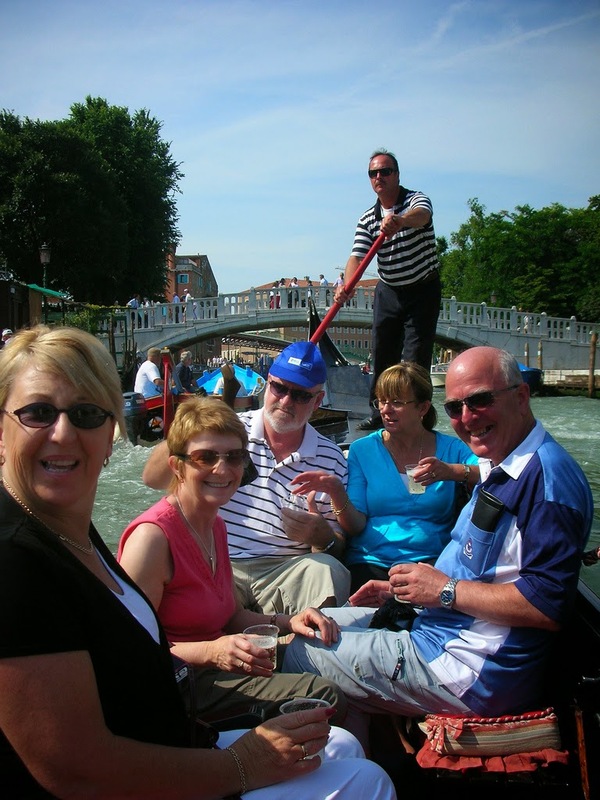 The association is composed of Italian friends who enjoy living here and are willing to share their culture. There has already been a series of events and Saturday’s was mainly about food and wine. Restaurants such as Ballincollig’s Bacco and Douglas Cafe Moroni’s were represented. Moroni's were selling some gorgeous sauces. There were tasters of salamis and you could buy slices of tarts and much more. There too you could buy Fabio Cavallini’s Traditional Balsamic Vinegars of Modena. Some were very old and very expensive and he also had a walnut liquor. 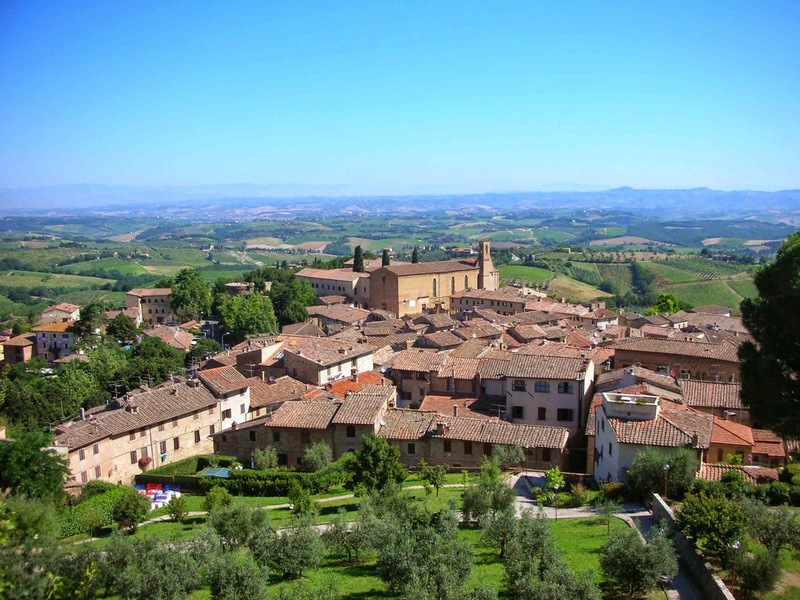 You could even book a Italian chef to come to your home and serve up an authentic Italian meal! Not surprisingly, the Boot (based on Forge Hill) had a big display and I couldn’t resist buying a pack of their Amaretto biscuits, also some salami. 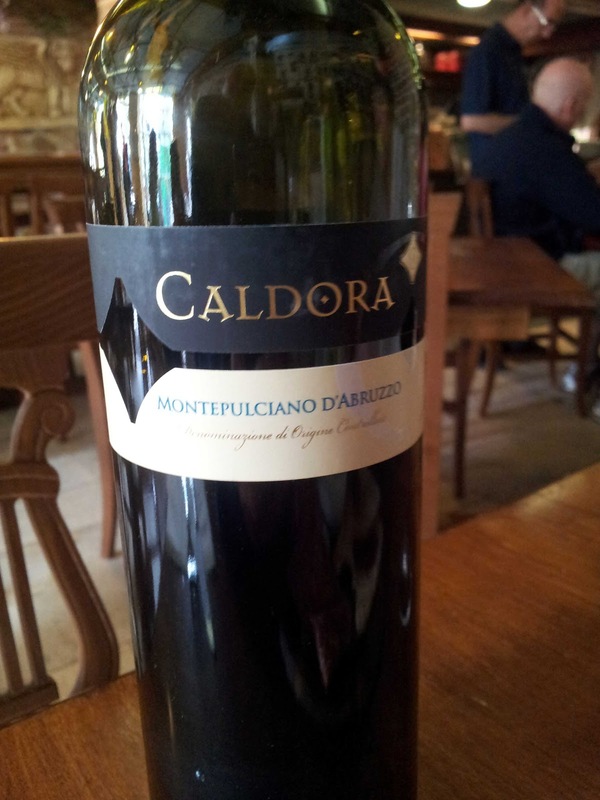 Some tempting wines were also on display, including Montepulciano and also Vermentino di Sardegna. Will have to call out to Forge Hill to see more of their 850 products. Next food stop was the Coal Quay Market and a call to Tom’s Bakery stall. 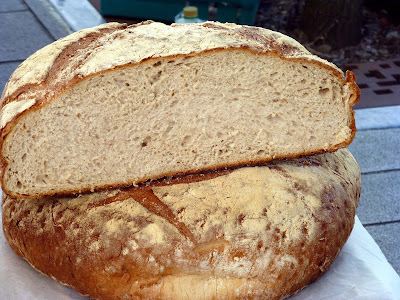 Usually go for the Country Baguette but this time picked a quarter of his huge Country Loaf and enjoyed it in a big way over the weekend. 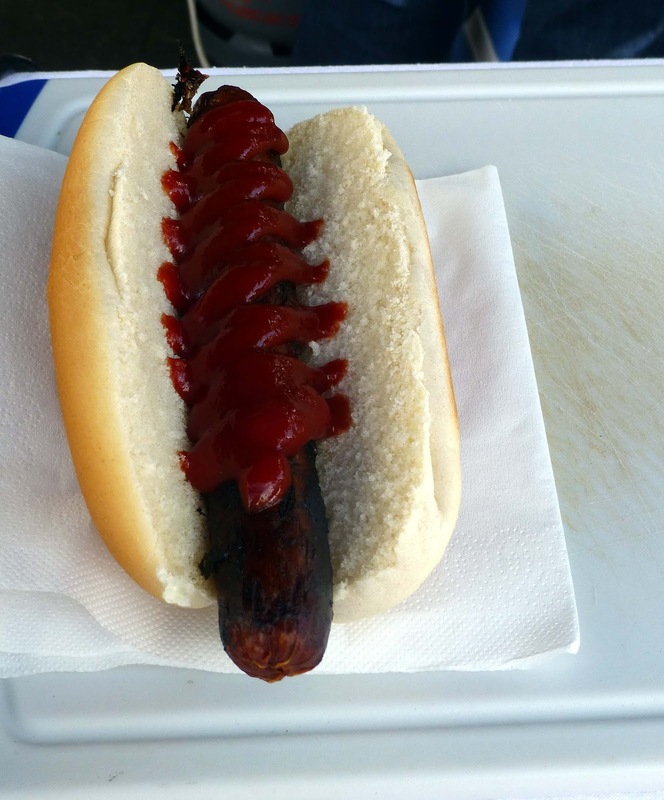 There was also a little market in Paul Street in front of KT Max and here I grabbed a bite of lunch, this in the shape of a hot dog (€4.00), one with a Venison sausage from the Crough Farm stall. In Venice, you will see the Lion of St Mark all over the town. You will also see it on the wall of Pizzeria San Marco which is just down the road in Midleton. Here the restaurant, which opened two years back and has been making friends since, proudly boasts about their authentic Italian dining experience. They have an authentic Italian wood-burning oven and charcoal grill. And also that Lion of St Mark on the wall. Had been hearing good things about this Pizzeria over the last 12 months and got a chance to call down last week. 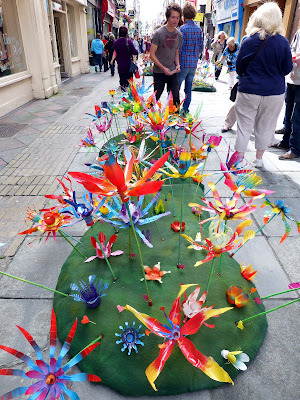 It is on the Cork City side of the town, not too far down from the site of the weekly Farmers Market. Front of house are very friendly and the chairs are comfortable. The menu is wide ranging, as you see for yourself by visiting the website. I’ve always enjoyed the shared meat dish that other Italian restaurants use and we went for it here and were delighted. The Antipasto Platter consisted of Cured Italian meats with a selection of cheeses, olives and sun dried tomatoes and cost €10.30. 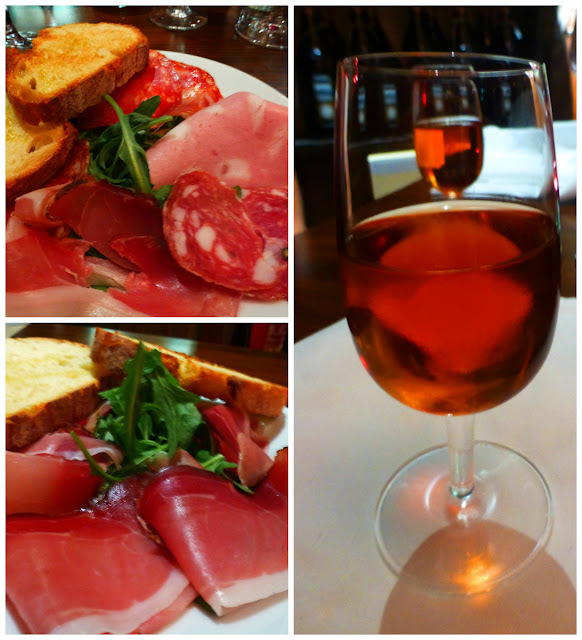 It was a well-balanced plateful and was helped on its way by a gorgeous Montepulciano. 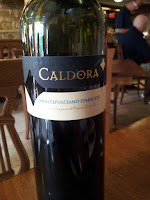 We had actually been about to pick a Sangiovese Merlot from the understandably short list until our genial waiter Mario suggested the Caldora Montepulciano. It is from the Abruzzo region with a full body, intense, persistent and fruity. And, as Mario said, goes well with meat and cheese. Cost per bottle is 22 euro, per glass 6.25. As you’d expect, they have a long list of pizzas. 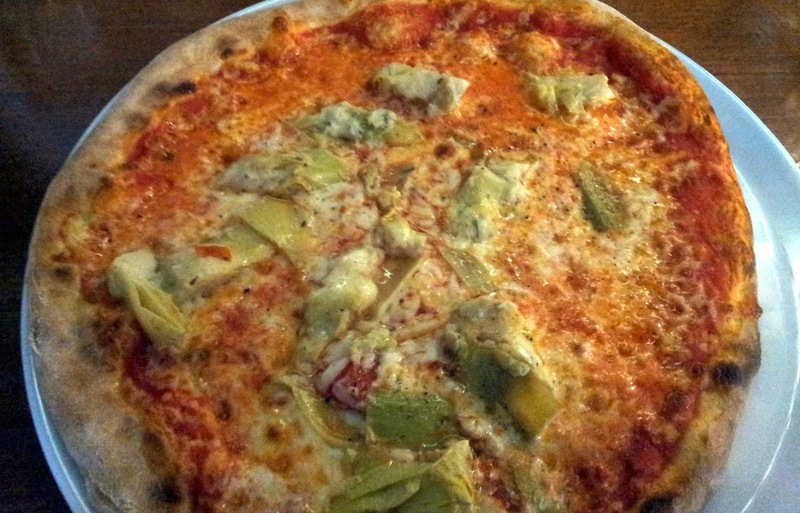 The special on the night was the Macroom Pizza, featuring the Toomsbridge Buffalo cheese, but I went for the Carciofini which had tomato, mozzarella and artichokes and cost €11:30. Must say, glad to say, it was top notch, a great mix, well balanced and the artichokes more than held their own. CL picked the Lasagna: Baked pasta layered with Bolognese and Béchamel sauce, topped with Parmesan cheese, served with garlic bread (€12.50). I had a sample and it was just brilliant and, more importantly, she concurred, enthusiastically. 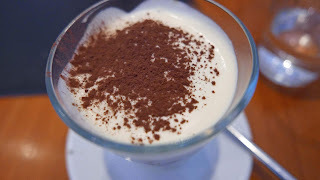 We were pretty full after the opening two courses and shared the Tiramisu: A layer of "savoiardi" biscuits with coffee liquor, mascarpone cheese and cocoa – €6.50. After the first spoonful, we were inclined to order a second helping but beat off the temptation. The Restaurant @ Donnybrook Fair is delighted to welcome Cesare Benvenuto from Pio Cesare on Wednesday 28th September at 7.45pm to host an Italian wine dinner. Cesare will introduce a selection of traditional Piemontese wines which have been produced by his family for five generations in their ancient cellars, located in the town of Alba. The evening is priced at €60 per person or €100 per couple.